Cheesy jokes are for everyone and we promise no matter how tough you think you are, there is a jokes that will make you crack. You cannot put a price on a good sense of humor and right up there with dry humor, slapstick is our favorite! The ability to find the funny side in everything is a rare and priceless gift and we elaborate to provide you the best jokes with playful wordplay. If delivered with enough enthusiasm, these are sure to get you a few or maybe more chuckles. Jokes go a long way. Not only are they good for the soul, but they helps people bond with others in a really fun way, so if you’re looking to tickle your funny bone, look no further than this great list. What is an astronaut’s favorite place on a computer? Why did the banana split? Because it saw the ginger snap. Which month do soldiers hate most? What runs but doesn’t get anywhere? I ate a clown fish last night. When the punch line is a parent. Do you swear to pull the tooth, the whole tooth and nothing but the tooth. What do you get when you cross a smurf and a cow? What is an elf’s favorite type of music? Why did the sea monster eat five ships that were carrying potatoes? No one can eat just one potato ship. 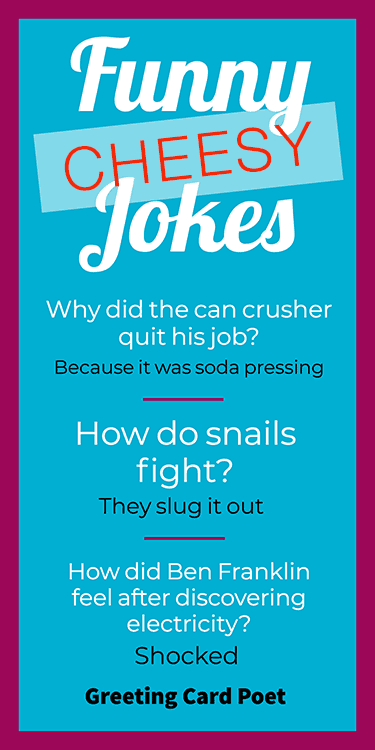 Check out our Best Corny Jokes – a close relative to Cheesy. How do you impress a baker when you’re taking his daughter on a date? Why did the yogurt go to the art exhibit? Where do cows hang their paintings? Because it was soda pressing. What do bees do if they want to use public transport? Wait at a buzz stop. What can you serve but never eat? You would too if you had to change in the middle of the street. They take the school buzz. When is a car not a car? When it turns into a garage. Try out our goofy jokes for kids page. Why did Johnny throw the clock out the window? Why did the man put money in his freezer? He wanted some cold hard cash! Because he wanted to make a clean getaway. Why do bananas wear suntan lotion? Have any cheesy jokes for this page? Let us know via the contact page. Which Disney princess is a cow’s favorite? How did Ben Franklin feel after discovering electricity? Why do people love the way the earth rotates? Because it really makes their day. Why did the poor man sell yeast? What kind of shoes do all spies wear? Because they don’t meet the koalafications. Why did the cookies admit himself to the hospital? What kind of tea is hard to swallow? What do you call an unpredictable, out of control photographer? Don’t look now, but something between us smells. What did the man say to the wall? One more crack like that and I’ll plaster ya! They don’t have the guts. Where do all the letters sleep? Because he was out-standing in his field. 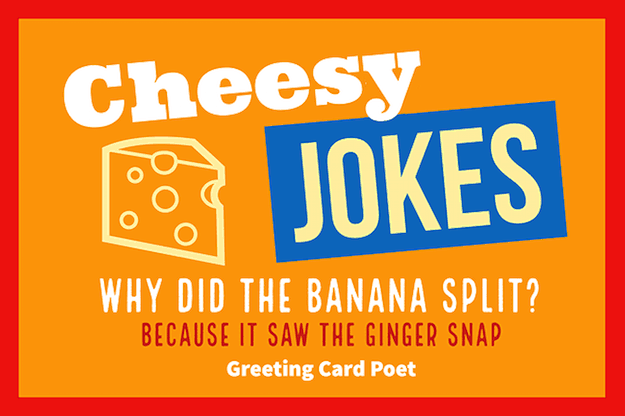 What did Gorgonzola say to Cheddar? When should you go on a cheese diet? If you need to cheddar a few pounds. Why does cheese look sane? Because everything else on the plate is crackers. What do you call a cheese factory in the Middle East? Why did the Greek woman stop eating cheese? Because she was getting Feta and Feta. What does a lady in a shopping mall do with a cheesy credit card? Go on a shopping brie. What is a basketball players favorite kind of cheese? Why did the man ask the woman if her dad was boxer? Cause he said she’s a knockout. Why did the girl fall in love with the robber? Because he stole her heart. Why do people love bananas so much? Because they are so a-peeling. What did the bank teller say to the lovely woman? Can I take you out on a date, because you’ve got my interest. What did the oven say to the baked cookie? What did the smitten vinegar say to the baking soda? You make me feel all bubbly inside. What did one sock say to the other sock in the hospital? Don’t worry, I will be with you every step of the way. What do herb gardeners get for good work? A thyme and a half. How much does the mathematician like angles? How do you fix a broken brass instrument? What do you call a group of musical killer whales? Why should you always tie your shoes on Valentine’s Day? Because if not, you’ll be falling for everybody. Why was the omelete so happy? Because it was egg-cited to see the frying pan. Why should you ever trust a pencil? Because it can erase your past and write our future. Why did the female shirt fall for the male shirt? Because he was made of boyfriend material. What’s a blackboard’s favorite beverage? What subject do witches like best? How do you repair a broken jack-o-lantern? What did the crowd tell the comedian who had terrible police jokes? Why can’t dogs operate an MRI machine? Why did the apricot invite the prune to the dance? How is your long distance relationship going? Why did the cow go in the spaceship? It wanted to see the mooooooon. What do you call a salad dressing wearing shades? Why did the baseball player bring a rope to the game? He wanted to tie the score. My sister bet me $100 I couldn’t build a car out of pasta. You should’ve seen the look on his face when I drove pasta. You’re on Cheesy Jokes page.